In the United States, the 3-1-1 telephone number allows city residents at the municipal level to phone in their various maintenance requests. From broken street lights to pot holes, citizens become the “eyes and ears of their neighborhoods” are able to file their complaints and document the problems that they would like to see resovled in their city. 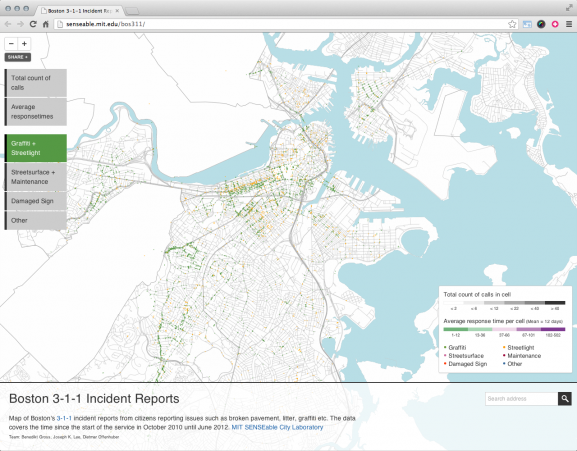 This maps shows all of the 3-1-1 calls from Boston, MA, from 2011, collected from the Citizen Connect Mobile Application. 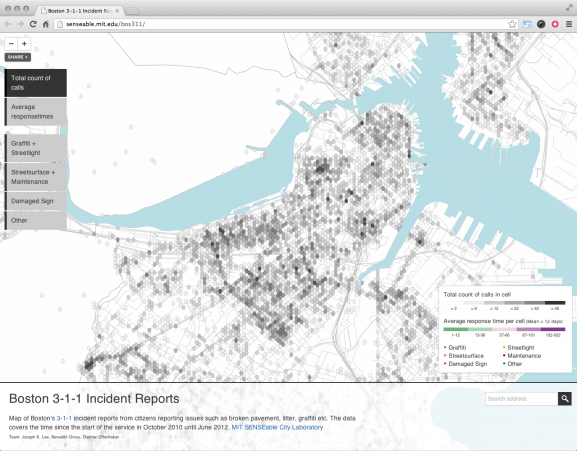 This project was a quick look into this dataset, carried out by Joey Lee, Dietmar Offenhuber and Benedikt Groß at MIT Senseable City lab in July 2012.